I spent a few hours last weekend strolling through our city's annual art fair. More than 100 artists from around the country exhibited ceramics, drawings, fiber, glass, metalwork, painting, photography, printmaking, sculpture . . . and digital art. I do most of my art viewing through books, magazines and computer screens. So I was astonished by both the visceral power of work rooted in physical materials, and the relative soullessness of even the best pieces springing from a purely digital medium. Don't get me wrong. I love digital art. The use of software tools can facilitate compelling imagery that is not possible through traditional means. But there is a living presence latent in the deep complexity of the atomic/subatomic world that cannot be actualized through algorithm. 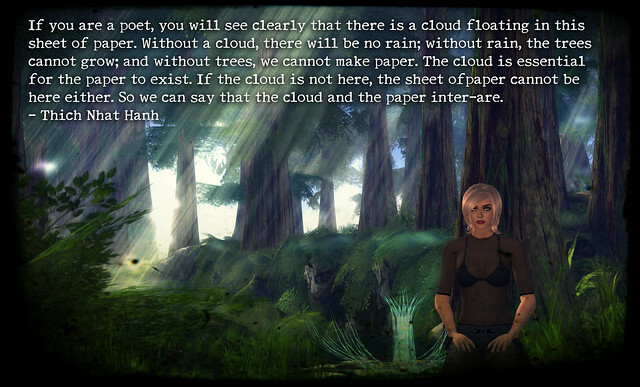 The virtual realm can simulate only an infinitesimal fragment of the profound interbeing referred to in Thich Nhat Hahn's poetic vision. Although it's true that the great can be the enemy of the good, in my case it's more that the cool is the enemy of the profound, and that flash is the enemy of substance. I'm finally accepting the hard truth that my compulsion to constantly share new work is as much an expression of addiction as it is of creativity. Continually feeding my short term craving with drive-through digital art is undermining my potential to satisfy the underlying hunger springing from a yearning to connect more deeply with myself and the world. So I'm going to finally do what must be done to actually follow through on my aspiration to take on more substantive projects. For the next month and a half, I'm limiting my online expression to text except for the two collaborative projects I've committed to, A is for Avatar and Single Frame Stories. I'll give it until Halloween and then reconsider. Given the likelihood that Linden Lab is going to to something parody-worthy between now and then, I may need someone to talk me down. Any volunteers? I'd volunteer my services as a sounding board and "voice of dispassionate reason" .. but I'm pretty much outraged by LL's repeated actions of "screw the customer" so I'd probably be a rotten choice to help you return to a level of emotional stability after they pull their next stunt. However, you're always welcome to contact me .. just in case you need more gasoline on the fire. Break away from that addiction and REALLY live. As someone who had gone through what you are now experiencing, I can only say that leaving the digital life has made life better, fuller and more creative. Harder? Absolutely. More fulfilling? Yes. Eventually you will compare the "corruption" happening in digital life/the metaverse to the awakening of your senses and mind as you rediscover what makes up a "real life". In addition, much of the virtual training you've already done will be applied to some new real life project...so none of what you've done in the past necessarily goes to waste. But don't be surprised by how strong the digital obsession can be to pull you back in. It's everywhere and hard to avoid. But one day, while you are looking at a beautiful sky, you will notice others are staring into their electronic filled hand like zombies...and it will all be clear to you. Good luck. I, Cecil, will be in spirit with you. Ahh Botgirl, your post made me cry. What to do when that connection with something deeper, that which what lies beyond what we can see, is lost. One can change the medium - from digital to pottery to music to oil painting, but I don't think one medium is ultimately better for evoking that, rather, I think a change in medium can knock something loose and cause a new perception, one that brings back the wonder. Isn't that what the magic is - seeing the world in a new way, seeing the bigger picture, loving just how amazing and beautiful it all is? One can know that in any act of creavity, from arranging words in a new way, or sounds, or numbers - the wonder of seeing the bigger picture, a precious little glimpse of God. Darrius: Thanks for the offer. I don't have any bad feelings about what they do. At this point, it's like Roger Rabbit and the "shave and a haircut" prompt. Cecil: Marshall McLuhan saw new mediums as emphasizing certain senses over others, and I think he was right on. The utter pervasiveness of networked computing seems to be subsuming just about every other medium within its umbrella. It mediates an increasing percentage of our time, attention and even interpersonal communication. So my intentino is to take a retreat and then reengage with more balance. Luna: I agree with you that changing mediums can allow us to experience the world in a new way and meet life with "beginner's mind." That said, I don't think that the digital and physical worlds are equivalent. When I'm in a Second Life forest, it can trigger a feeling of being in nature, but I am within my imagination, not within the web of life that exists within an actual ecosystem. The image at the top of the blog post was meant to be ironic, in that the inter-being described in the text, was not present in the virtual world that was pictured.